The latest census info released last week show NC metros among the top 100 in growth. Time period is from July 2000 to July 1 2006. Expect to see Alamance County/Burlington's "metro" continue to grow at a high rate. Hopefully plans for many of Alamance County's downtowns to revitilize come in to fruition. 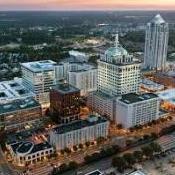 I'm impressed with Wilmington's growth. I thought Boone was growing... I haven't been there in a few yrs but it seemed to be growing last time I was there. I'm sure that Roanoke Rapids' growth will be spurred on by the new projects going on there. I'm really happy to see Elizabeth City's growth. I just hope the city is smart about it. I was there earlier this month and there are a number of planned housing developments, hotels, etc. going up along Halstead going toward the new Super Wal-Mart and US 17 bypass. Someone posted this on another forum and thought it was an interesting find. Per them, on a local NBC affiliate, it was announced that studies show that by 2030 NC population will increase by 50%. They likened it to the entire population of the state of South Carolina moving into NC.